Background: Micromeria species are rich in bioactive compounds such as phenolics which have several medicinal properties. Different solvents are used for extraction of these substances from natural products and solvent type has a major importance in extraction efficiency. 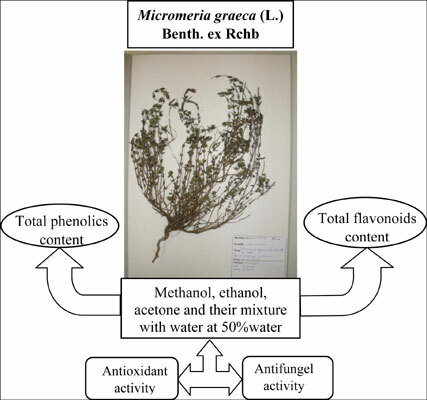 In this context, three solvent systems of methanol, ethanol and acetone and their mixture at 50% were used to extract the phenolics with biological effects from Micromeria graeca (L.) Benth. ex Rchb. Methods: The total phenolic and flavonoid contents were determined by the Folin-Ciocalteu and aluminium chloride methods, respectively. The antioxidant capacity of the extracts was evaluated using three different assays. The antifungal capacity against the two strains Candida albicans and Aspergillus niger by using the method of diffusion on disc was also carried out. Results: The 50% acetonic extract gave a better rate of extraction which is 14.4% and presents the highest contents in total phenolics and flavonoids which are of 46.7 ± 2.3 mg gallic acid equivalent /g dry matter and 2.4 ± 0.1 mg quercetin equivalent/g dry matter respectively. A better antioxidant activity for the various tests was observed for 50% methanolic and acetonic extracts. The extract of 50% acetone recorded the most important antifungal activity. Conclusion: The findings of this study showed that the extract prepared with the 50% acetone from Micromeria graeca has the highest phenolics content and revealed the best biological activities. So, this study has allowed us to find the suitable solvent for the preparation of the M. graeca extract for several uses. Antifungal activity, Micromeria graeca (L.) Benth., phenolic compounds, polar extracts, radical scavenging activity, reducing power, total antioxidant activity.